The timing for establishing a joint venture in Thailand seems strange as AirAsia X is now in the final stages of preparing for an initial public offering, with a listing expected to debut on the Malaysian stock exchange around the middle of this year. But hammering out a deal with Thai AirAsia and its shareholders could boost AirAsia X’s outlook ahead of the IPO, potentially increasing investor appetite which so far has been relatively lukewarm. One of AirAsia X’s biggest risks is a potential roadblock in its ability to secure joint venture partners in new markets. Finding partners can be a challenging task, particularly if AirAsia Group’s existing short-haul partner in any of its markets is not amenable to also working with AirAsia X in establishing a second operating certificate for the long-haul market. Securing a separate partner is technically possible but without the support of the existing short-haul partner as short-haul feed is an integral part of the long-haul low-cost model. Completing a deal for a Thai affiliate ahead of its IPO would provide a reassuring message and give potential investors more confidence that the model can be duplicated in other markets. AirAsia X will need multiple bases to grow and prosper, and to set up such non-Malaysian bases new affiliates need to be established that are majority owned by local partners. Of course this is not a new recipe as it has been tried and tested by the AirAsia Group, which has successfully grown by establishing affiliates and opening bases throughout Asia. But with AirAsia X it becomes more complex due to its different ownership structure. AirAsia X is not part of the AirAsia Group and only has access to the AirAsia brand through a licensing agreement. But there is common shareholding, with already Malaysia-listed AirAsia Berhad holding an 18.3% minority stake in AirAsia X, which is expected to be reduced to 12.1% following the IPO. Aero Ventures, an investment arm of AirAsia Group CEO Tony Fernandes along with associates, owns a majority 52.2%. Mr Fernandes will remain the largest shareholder as the Aero Ventures stake will be reduced to 34.4% after the IPO. While AirAsia X is not part of the AirAsia Group, its model is heavily dependent on feed from AirAsia Berhad. It also uses the AirAsia brand and website, resulting in a seamless experience for passengers regardless of which carrier operates their flight. AirAsia X will look to duplicate at Bangkok its successful formula in Kuala Lumpur, where over half of its passengers connect to or from flights operated by AirAsia Berhad. AirAsia Berhad and AirAsia X offer a “fly thru” connection product to several AirAsia destinations within Malaysia and throughout Asia. Bangkok – along with Phuket, Bali, Singapore and Jakarta – has been one of the biggest AirAsia destinations sold by AirAsia X. AirAsia has nine daily flights between Kuala Lumpur and Bangkok (six from AirAsia Berhad and three from Thai AirAsia), providing connections to all 14 of AirAsia X’s existing destinations. By establishing a base in Bangkok, AirAsia X will be able to offer its existing customers that are flying to or from Bangkok a non-stop product. AirAsia X does not plan to open completely new destinations from Bangkok but simply connect the dots and leverage markets it already serves on a one-stop basis. AirAsia X is reportedly seeking Thai Government approval to operate routes from Bangkok to Korea and Japan. But sources say Australia is also part of the business plan with Melbourne a potential launch destination. AirAsia X already carries a large number of passengers between Bangkok and its four Australian destinations – Melbourne, Gold Coast, Perth and Sydney. 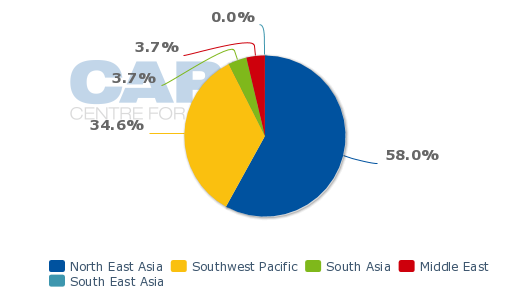 Australia currently accounts for 35% of AirAsia X’s seats and 42% of its ASKs, according to Innovata data. Serving Australia from Thailand directly is logical given the success AirAsia X has had in Australia, which has been by far its most profitable market. Australia-Thailand is a large and fast-growing market. Offering a non-stop product from Australia to Thailand will allow AirAsia X to better compete with market leader Thai Airways as well as rival long-haul LCCs Jetstar and Scoot. Thai Airways currently operates 39 weekly flights to four destinations in Australia – Brisbane, Melbourne, Perth and Sydney. Thai Airways currently accounts for an overwhelming 71% of non-stop seat capacity in the Bangkok-Australia market. The carrier reported a 13% increase in RPKs on its Australian routes for 2012 along with an impressive 10.5ppt increase in load factor to 77.7%. Thai Airways will likely expand in Australia as part of its increased focus on the Asia-Pacific region as it looks to reduce its dependence on the challenging European market. Looking to match AirAsia X’s success in the one-stop Australia-Thailand market, Scoot selected Bangkok as its third destination after Sydney and the Gold Coast. With its very low Australia-Bangkok fares, Scoot has provided AirAsia X with new competition at the bottom end of the market. By establishing a base in Bangkok and opening non-stop routes to Australia, AirAsia X will one-up its rival and make it harder for Scoot to pick up Australia-Thailand passengers with its one-stop product. Jetstar also serves the Australia-Bangkok market with three weekly non-stop flights from Melbourne along with a daily one-stop connection from Melbourne via Singapore. Jetstar also offers one-stop services from Darwin and Perth to Bangkok via Singapore. Qantas and its new partner Emirates are the only other carriers with non-stop services between Australia and Bangkok. Both have a daily flight from Sydney. The Bangkok to Brisbane and Perth markets are currently only served non-stop by Thai Airways, providing a potential opening for AirAsia X service from Bangkok to the Gold Coast (located just south of Brisbane) and Perth in addition to Melbourne and Sydney. Tokyo, Osaka and Seoul are also logical markets for AirAsia X from Bangkok as they are already served by AirAsia X from Kuala Lumpur and are large destinations from Bangkok. AirAsia X serves these markets via Kuala Lumpur but likely does not pick up a significant number of passengers in Bangkok given the backtracking required. There are currently over 82,000 weekly seats between Bangkok and Japan with service from five carriers, according to Innovata data. 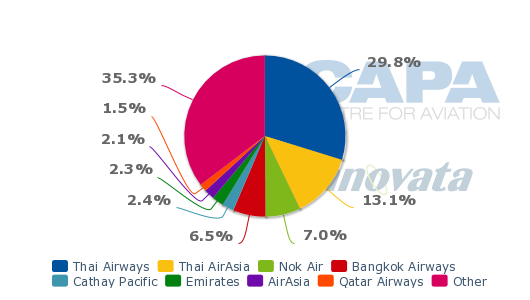 There are no LCCs in the market and Thai Airways is the dominant carrier, with 58% of seat capacity, according to Innovata data. There are about 60,000 weekly seats in the Bangkok-Korea market. Korean Air has a leading 31% of capacity followed by Thai Airways with 28%. Four Korean LCCs serve the market with narrowbody aircraft – Eastar Jet, Jin Air, Jeju Air and T’way – but combined account for only for 24% of capacity in the market. AirAsia X should have no problem competing against the Korean LCCs, which have much higher cost structures. AirAsia X’s A330s are also better suited for the Bangkok-Seoul market than A320s or 737s given it is a five hour flight, which while within range of a narrowbody is a length of flight several LCCs including AirAsia shy away from. North Asia is a larger and generally profitable market for AirAsia X, accounting for 58% of seat capacity. In addition to Tokyo, Osaka and Seoul the carrier currently serves five markets in greater China – Beijing, Chengdu, Hangzhou, Shanghai and Taipei. From Bangkok, most of greater China will continue to be served by Thai AirAsia with A320s. From Kuala Lumpur, the China market is split roughly evenly with AirAsia Berhad covering routes of up to four hours and AirAsia X routes of over four hours. But from Bangkok, only Beijing and northern China is over four hours away. Destinations in the Middle East are also a possibility from AirAsia X’s new Bangkok base. AirAsia X currently serves Jeddah from Kuala Lumpur and suspended services to Tehran in Oct-2012. Both destinations are potentially lucrative markets from Bangkok, with Bangkok-Jeddah currently served by Saudia and Thai carrier Business Air and Bangkok-Tehran served by Mahan Airlines. Inbound demand for Bangkok is huge, giving AirAsia X plenty of opportunities, particularly as the market is leisure focused and price sensitive. The Bangkok base also opens up new one-stop connections for AirAsia passengers throughout Thailand and regionally. Thai AirAsia has a strong domestic network with 13 domestic and 19 international destinations, according to Innovata data. Most of its domestic destinations and a few of its international destinations, such as Mandalay in Myanmar and Xian in China, are not served by AirAsia from Kuala Lumpur. Currently AirAsia’s website only offers a fly-thru product at Kuala Lumpur, where a new low-cost terminal is expected to open in mid 2013, significantly improving the transit experience. But AirAsia has been working at bringing the fly-thru product to Bangkok Don Muang, where Thai AirAsia has been based since moving from congested Bangkok Suvarnabhumi in Oct-2012. Having the connection product in place is essential prior to the launch of AirAsia X’s new Thai affiliate. Forging a commercial relationship between AirAsia X and Thai AirAsia is also essential before establishing the new carrier. The ownership structure of the new AirAsia X affiliate is still being finalised but regardless of the outcome Thai AirAsia will have a role and support the new carrier. Thai AirAsia completed an initial public offering in 2012 but its CEO, Tassapon Bijleveld remains, the largest shareholder. While not yet finalised or announced, the joint venture agreement is essentially completed and has the support of the Thai Government. Securing an operators certificate and traffic rights is not expected to be a major challenge. But the process will take some time and until the new carrier has made significant progress it will not set a launch date. A late 2013 launch is still possible but most likely the new carrier will launch in early 2014. AirAsia X has the aircraft needed to launch and rapidly expand a new affiliate. It currently operates nine A330s and has seven more A330 deliveries scheduled for the remainder of 2013 and another seven A330s coming in 2014. AirAsia X plans to take a final 10 A330s in 2015 to 2017 while the first of at least 10 A350s is expected to be delivered in 2018. It would be challenging for the Kuala Lumpur base to support all 14 of the aircraft that AirAsia X is committed to adding in 2013 and 2014. The larger fleet will give AirAsia X an economy of scale it has not yet enjoyed. But ideally the aircraft will be spread across multiple bases. AirAsia X is currently planning to add capacity in several of its existing markets from Kuala Lumpur. It is looking at launching new destinations in Australia, China and Japan but not at entering new countries or resuming flights to India, New Zealand and Europe (which were all cut as part of a route rationalisation in 2012). While there is still a lot of room for growth from Malaysia, there are even more growth opportunities from Thailand. Thailand has a huge LCC market but with the exception of a small number of Jetstar flights from Australia so far penetration has been limited to Southeast Asia, India, China and Korea. International LCC passenger traffic in Thailand has nearly doubled in the last four years, from 3.5 million in the fiscal year ending 30-Sep-2008 to 6.9 million in the fiscal year ending 30-Sep-2012, according to Airports of Thailand (AoT) data. But LCCs in Thailand, which have over 50% of the domestic market, are just starting to scratch the surface when it comes to the international market. There were about 45 million international passengers in Thailand in FY2012, with LCCs only accounting for about 15%. 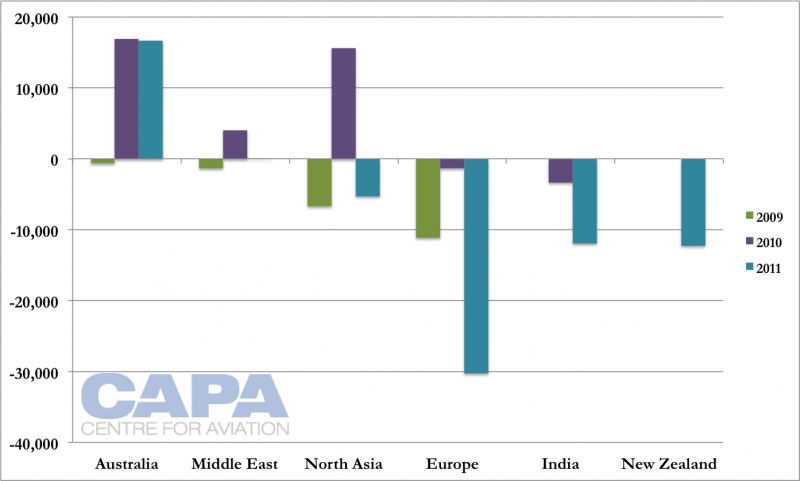 The launch of a long-haul low-cost operation will significantly drive up the international LCC penetration rate. It will also allow AirAsia to close the gap with Thai Airways. According to AoT data, Thai Airways carried 19 million passengers to and from Bangkok in the fiscal year ending 30-Sep-2012 compared to 7.3 million passengers for the AirAsia Group (includes 6.4 million passengers for Thai AirAsia). When including Nok, which is 49% owned by Thai Airways, the Thai Group carried nearly 23 million passengers, giving it about 43% of the Bangkok market compared to only 14% for the AirAsia Group. For all of Thailand, Thai and Nok combined currently account for about 37% of total seat capacity compared to 16% for the AirAsia Group (includes 13.1% for Thai AirAsia, 2.1% for AirAsia Berhad and 0.6% for Indonesia AirAsia). With AirAsia X entering, the AirAsia brand could eventually approach Thai’s market share but it is unlikely it will reach the market share it now enjoys in its home market of Malaysia. In the smaller Malaysian market, the AirAsia brand currently accounts for 44% of seat capacity compared to 36% for the Malaysia Airlines Group, according to CAPA and Innovata data. Thai Airways should be concerned. A low-cost long-haul solution is clearly missing from its portfolio, which includes a short-haul low-cost brand in Nok and a short-haul hybrid brand in Thai Smile. Thai Airways and Nok have looked into establishing a low-cost long-haul player but have yet to commit, even with AirAsia X angling for the last couple of years to enter the Bangkok market. Nok, which only operates domestically and plans to begin regional international services in mid-2013, studied the long-haul LCC model closely in 2012. But Nok says at least for the time being is not considering expanding into the long-haul market. Thai Airways has looked at expanding Thai Smile into the long-haul market. But Thai Smile, which was originally envisioned as a low-cost regional hybrid carrier, has evolved into a full-service carrier and does not have a low enough cost structure to take on AirAsia X.
Thai Airways should give serious consideration to establishing a new brand for the long-haul low-cost sector, following the strategy of Singapore Airlines which has a 100% stake in Scoot but only a 33% stake in short-haul LCC affiliate Tiger Airways. Nok has a strong domestic brand but lacks the international recognition to be a strong player in the inbound Thailand market while Thai Smile is best off maintaining its regional focus following a similar model to SIA subsidiary SilkAir. Thailand has huge medium/long-haul LCC potential, which will be exploited in coming years not only by AirAsia X but by more foreign LCCs such as Norwegian. 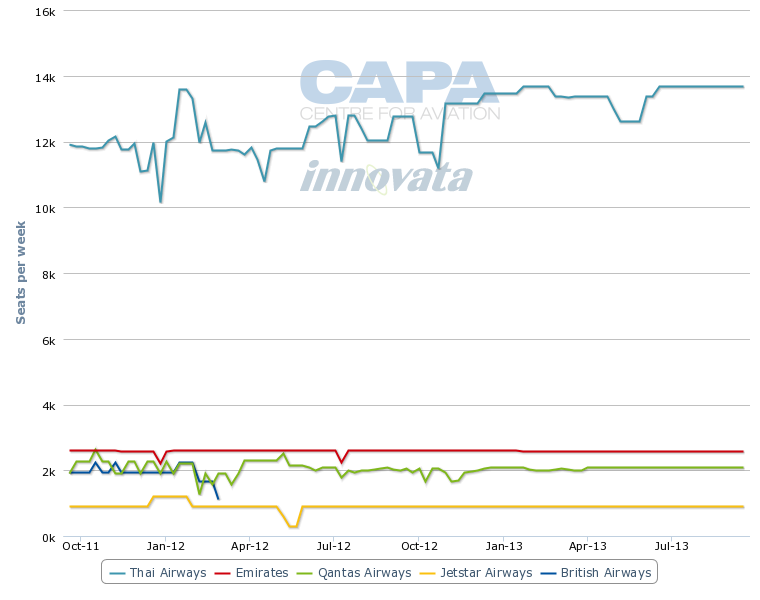 If Thai Airways does not react quickly it risks losing more market share to LCC competitors.